I thought I was further along in my pregnancy, but because of my irregular menstrual cycles, a nurse recommended I have an ultrasound. If they measured the fetus, they could determine how far along I was. So we immediately scheduled an ultrasound, and I was in for a few surprises. The day of the ultrasound, I was nervous about drinking all that water they recommend before an ultrasound, and driving all the way to the hospital. I didn't make a wise choice when selecting my OB, because I have to travel to three different locations anytime they need to see me. The place where I had to have my ultrasound, was very far away (about 20-30 minutes). It seems close, but with a full bladder, this is a joke. I drank four glasses of water, and half way there I started feeling the urge. That urge quickly turned into pain, and finally I was literally in tears and ready to run over anything that came my way. My mom came along for the ride, and she saw my desperation and tried to distract me as much as possible. But that pressure was not something you can put on the back burner. It was very intense. But, it got worse. When I opened the door and got out of my car, I thought I was going to either pass out, or pee on myself. I was in so much pain I couldn't even walk. 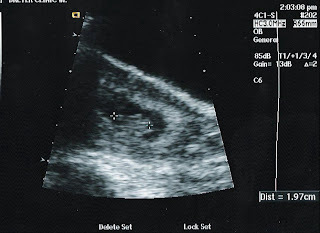 After a few minutes the spasms got a little less intense, and I walked as quickly as possible to the ultrasound floor. I told them of my pain, and they said I could relief my self "just a little bit". I thought this was an impossible task, but I did it. There was a bit of a relief, but soon, it started to hurt again. When they finally called me in, I sat on the table and wanted to get this over with. The excitement from seeing the baby on the monitor was stronger than the pain, so I didn't complain. But much to my surprise, I was about a full month less advanced in my pregnancy than what was originally believed. So, because the fetus was so small, I had to go to the washroom, and empty my bladder so that they could perform an internal ultrasound that would give them a better view. After all the pain and suffering from driving to this place for half an hour with a full bladder, and I had to empty my bladder for this ultrasound! Of course, it was all well worth it when I saw the little flickering heartbeat on the monitor, and the little arms moving up and down, but I wish I would have done things a little differently. For anyone who's reading this and has an ultrasound in the near future, I have a few suggestions. Drive to the appointment with an empty bladder, and take a long a few bottles of water. Get there about and hour early, and take a book, magazine, or your Ipod. While you're waiting, drink your water in the waiting room. By the time they call you in, your bladder is full, and you prevented the long, painfull drive.